The Wood Frog is one such species that has ever so amused biologists and scientists. These tiny creatures are associated with an incredible ability of freeze tolerance; apart from this it also has interesting preying habits and is marked to exhibit long range movements too. 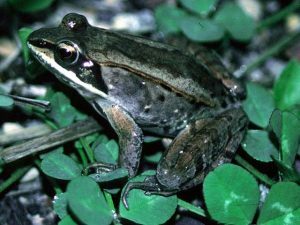 The wood frog is designated as the state amphibian of New York. North America has a wide distribution of wood frogs in many regions. Color: These tiny frogs are generally tan, pink or dark brown in color. 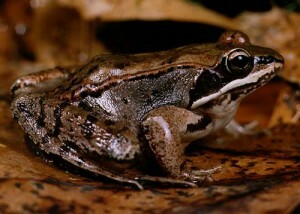 The ‘dark eye mask’ which abruptly ends behind the eardrum, is a prominent feature of the wood frog. It is not unusual for these creatures to have a light line running down their backs. The area of the belly is white in color with some dark mottling. Size: The tiny wood frogs are approximately 3.5 to 8.3 cm in length. Toes: These frogs do not have fully webbed toes. In fact the males have thumbs that appear to be swollen. Characteristic of most North American frogs, the wood frog also prefers to hibernate in proximity to the surface in soil or even leaf litter. These frogs have a unique body mechanism that helps them to combat the extreme cold climates. Their body functions to accumulate urea in their tissues and liver. Furthermore the conversion of glycogen in to glucose helps them to combat the ice formation in most parts of their body. They can still fight such freezing conditions even when 65% of the body water freezes. The ‘Rana Sylvacta” or “Kermit the Frog”or the” Frog Prince” from the fairy tales lives for 2-3 years if it is lucky enough to make it that far. Our tiny Frog Prince loves to feed on bugs and algae. A close pattern is often made between the feeding pattern of the wood frog and ranids. This prey movement is characterized by a thrusting forward movement followed by the opening of its mouth and prompt extension of the tongue directly on to the prey. 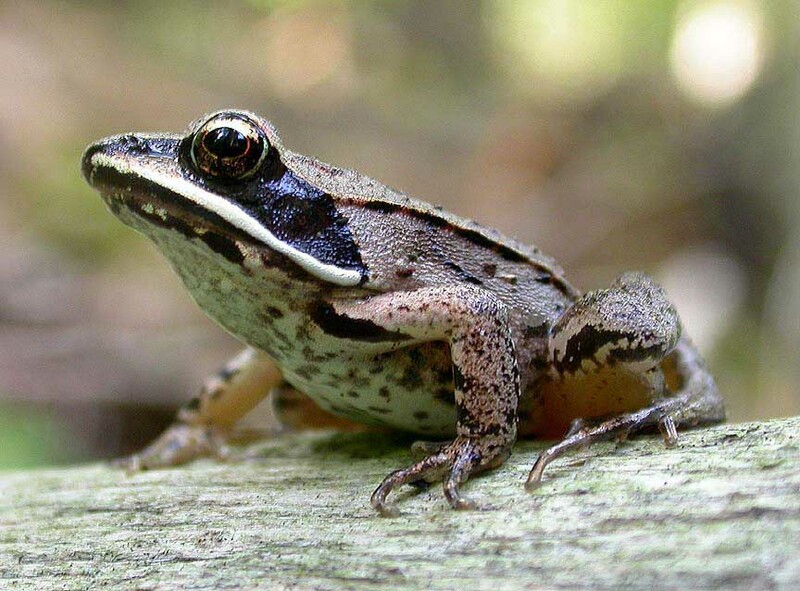 Wood frogs inhabit forests specially the areas of transient freshwater wetlands. In the eastern regions these creatures are mostly found in moist woodlands. These very creatures also prefer open grasslands in the western regions along with tundra belts of the far north. Wood Frogs are abundantly found and widely distributed in Alaska. 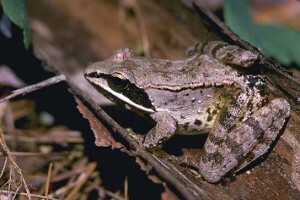 The range of these frogs begin from northern Georgia and northeastern Canada and extend further east to Alaska ending with Southern British Columbia in the West. Medicine Bow National Forest is also home to these frogs. The female has the capacity to lay up to 3000 eggs at a time. These eggs are usually deposited near submerged vegetation. The eggs are ready to hatch in a period of three weeks. The phenomenon of metamorphosis of the tadpoles takes place in about 2 months. Wood frogs usually prefer to hibernate under wood logs, leaf litter or stumps. During this period of hibernation, almost 65% of the water in their body gets transformed into ice. With the onset of spring it is as if these tiny creatures just thaw back into life! It is indeed a beautiful phenomenon. The wood frog is not an endangered species. It is absolutely amazing how these wood frogs can adapt to cold climates. In the winter months the wood frogs simply freeze! Their hear stops beating and so does their breathing. Their bodies crystallize into ice! These tiny creatures beat the chill by the production of a special kind of antifreeze that refrains or stops their body liquids from freezing! More so even their fertilized eggs are not affected by freezing! This particular kind, are the only frogs to be found if ventured north of the Arctic Circle. It is astonishing how these wood frogs can identify their brothers and sisters amidst other tadpoles. You can tell males from females by their swollen thumbs. In winter, Wood Frogs hibernate by hiding under rocks, stumps, or leaf litter. They don’t have to dig far. If they freeze, they can thaw out again. 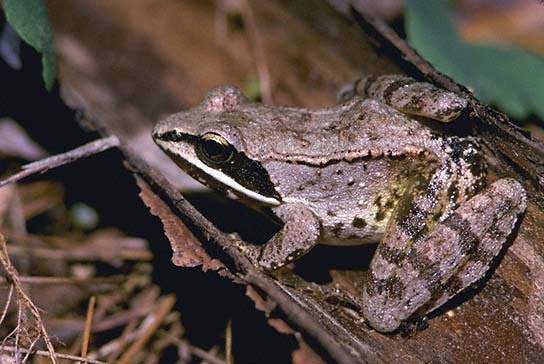 Wood Frogs are very active, and can jump farther than most frogs. To hunt, they can ambush prey, like most frogs, or sneak up on it. Feast your eyes on some lose up pictures of the wood frog!